When we lived in San Francisco, we drove up to Tahoe often. We were fortunate to have family that graciously let us use their townhouse at Northstar when it wasn't rented. While we skied at all the resorts around Lake Tahoe over the years, we spent the bulk of our time at Northstar and it's the place we return to when we have the chance. We love Tahoe mostly because of the warm weather. They get tons of snow; but the sun shines almost everyday regardless. It's not unheard of to see guys skiing shirtless or girls in shorts. Of course the downside of skiing in warm weather is the mash potatoes which will slow you down at the base or make traversing a catwalk painful. 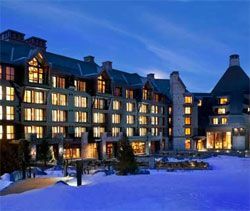 When we go back, we'll stay at the Ritz-Carlton Highlands (pictured above) which opened this season at Northstar. It has ski in/ski out access, a 17,000 sq. ft. spa, a gourmet restaurant, and (our favorite) the club level with five food services daily. We'll fly into Oakland where you can usually get the best flights, and spend a day or so in San Francisco and Sonoma before heading up to ski. Want to join us?